The Willamette Valley is an amazing place, with a rich geologic history, great soil, a moderate climate, and abundant water. The U.S. Environmental Protection Agency has designated the Willamette Valley ecoregion as a Level III ecoregion. It is slightly larger than the Willamette Valley for which it is named. The Willamette Valley ecoregion has less precipitation and lower elevations than neighboring mountainous ecoregions. The following table contains technical descriptions drawn from CEC Level III descriptions (document available below) produced for the EPA. 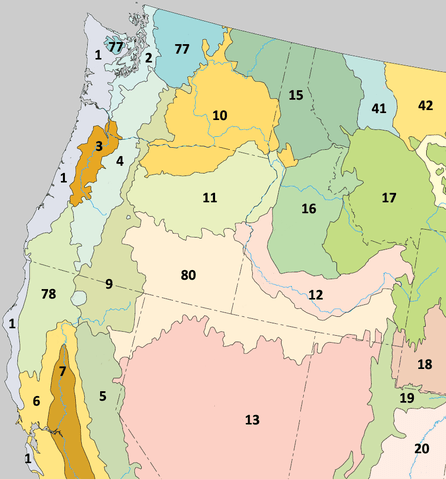 LOCATION The ecoregion covers an area of 14,900 square kilometers (5,800 sq mi), lying mostly in Oregon, with a small portion lying across the Columbia River in southern Washington. 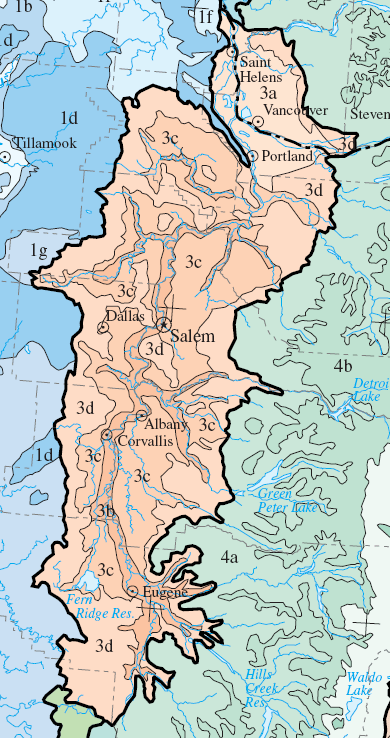 The ecoregion lies in the Willamette Valley, which runs from south to north between the Oregon Coast Range to the west and the Cascades Range to the east. The ecoregion is drained mostly by the Willamette River and its tributaries, which flows into the Columbia River straddled by Portland, Oregon. Covers the Willamette Valley in Oregon and a small area in southern Washington State. CLIMATE The ecoregion has a Mediterranean-type climate, with warm, dry summers and mild, but wet winters. The mean annual temperature is approximately 10 to 13 degrees Centrigrade. The frost-free period ranges from 165 to 210 days. The mean annual precipitation is 1228 mm, ranging from 900 mm to 1600 mm in the mountainous foothills. Average temperatures range from 50°F to 55°F. The frost-free season is five to seven months long. Average annual precipitation is 48 inches, ranging from 35 to 63 inches. VEGETATION Mosaic of oak savanna, oak woodlands, prairies, and Douglas-fir forests. Oregon white oak, Douglas-fir, madrone, some valley ponderosa pine are typical. Riparian areas with black cottonwood, oregon ash, bigleaf maple, Douglas-fir, western red cedar, and various shrubs. Almost all of the native prairies have been converted to other uses. The Willamette Valley is a very important crop-growing area. Clearing of forests have changed the composition of this landscape, with pockets of remnant forest still occurring scattered across the landscape. Many native prairies have been converted to farming and housing. HYDROLOGY Large rivers, numerous streams from adjacent mountainous regions. Numerous seasonal wetlands and ponds. A few reservoirs. Surface water is dominated by rivers and streams, plus seasonal wetlands and ponds. TERRAIN Mostly a rolling, broad, lowland valley. Elevations range from about 6 m to over 600 m on higher peaks. Landforms consist of terraces and floodplains that are interlaced and surrounded by rolling hills. Relatively deep alluvium, colluvium, and glacio-lacustrine deposits overlie Miocene volcanic basalt and marine sandstone. Soils are productive, have a mesic temperature regime, and a variety of texture and moisture characteristics. Mollisols and Alfisols are typical in the valley with some Ultisols and Alfisols in the foothills. The Willamette Valley is a rolling, broad, lowland valley. Elevations are low, as is topographic relief in the valley. Landforms are old terraces and floodplains. Deep soils and gravels cap volcanic basalts and old ocean sediments. Soils are productive. WILDLIFE Black-tailed deer, red fox, coyote, racoon, striped skunk, beaver, Oregon and grey-tailed vole, red-tailed hawk, Cooper’s hawk, Canada geese, mallard and northern pintail ducks, great blue heron, white-breasted nuthatch, chipping sparrow, a variety of amphibians and reptiles. Black-tailed deer, red fox, coyote, racoon, striped skunk, beaver, Oregon and grey-tailed vole, red-tailed hawk, Cooper’s hawk, Canada geese, mallard and northern pintail ducks, great blue heron, white-breasted nuthatch, chipping sparrow, a variety of amphibians and reptiles. LAND USE/HUMAN ACTIVITIES Productive soils and a temperate climate make it one of the most important agricultural areas in Oregon. Vegetables, fruits, nut orchards, nursery products, and grass seed production are typical. Vineyards and Christmas tree farms are common in the foothills. Some sheep and cattle grazing. Urban, suburban, and rural residential uses are spreading. It contains most of Oregon’s population, with larger cities including Portland, Gresham, Beaverton, Hillsboro, Salem, Albany, Corvallis, Eugene, and Springfield. Productive soils and a temperate climate make it one of the most important agricultural areas in Oregon. Vegetables, fruits, nut orchards, nursery products, and grass seed production are typical. Vineyards and Christmas tree farms are common in the foothills. Some sheep and cattle grazing. Urban, suburban, and rural residential uses are spreading. It contains most of Oregon’s population, with larger cities including Portland, Gresham, Beaverton, Hillsboro, Salem, Albany, Corvallis, Eugene, and Springfield.